Viral tweets are helping some people find help in Houston. Social media can do much better. People evacuate a flooded neighborhood in Houston on Monday. The replies to that tweet are devastating. Lynne Nguyen wrote that her 83-year-old parents, one with a heart condition and the other with Alzheimer’s, were knee-deep in water at their home and needed rescuing. She quickly revised her message: “Oops. Water was past knee deep an hour ago. Now waist high. Need evacuation. Please send help.” Others reported that they were in “imminent danger” but couldn’t get through to 911, so they’d resorted to calling news networks instead. One man said he’d called the Red Cross for help, only to be booted off the line then told he had to call 911 to get on the rescue list. Even if calls could get through to 911, without electricity and the ability to charge their phones, people in trouble could waste precious battery power waiting on hold on the off-chance that someone would pick up and record their location. Tweeting, which only takes a second and can be done from any internet-enabled device with a battery charge, seemed to many like a much better option. By Monday afternoon, the platform was full of desperate messages from Houstonians stranded in their flooding homes, sending out their addresses into the void, hoping to reach someone on a rescue team. Some tagged law enforcement or first-responder units; others embedded their calls for help in threads about rescue efforts. A few lucky families saw their requests go semiviral. More than 14,000 people retweeted Maritza Gonzalez Willis’ message saying that she and two children were stranded. The “water is swallowing us up … 911 is not responding,” she tweeted late Saturday night. Two hours later, she tweeted that they’d been picked up by a fire rescue team: “One of you had connections and all I can say is I’ll be eternally grateful!! !” On Facebook on Sunday night, Willis told her followers that Facebook, Twitter, and “every single one of you” had saved their lives. “I am humbled by your love and need all of you to know that your messages gave me the strength when all I wanted to do was cry,” she wrote. Willis told me in a Facebook message that her call made it to a 911 dispatcher, who “specifically told me no” and “would not dispatch anyone to help.” The operator “said they would have to transfer the call or dispatch me to a totally different different area,” Willis said. “I was so angry, [I] hung up on them and decided to use social media for help.” When firefighters finally knocked on her door, they asked Willis if she was “the lady requesting help from social media.” “Evidently, someone from Florida had called them off my tweet,” Willis said. Those whose tweets for help don’t get mass attention may still get advice from users who are trying to help from afar. Try to flag down helicopters with towels or sheets, some say, or press the OnStar button in a nearby car, or ask J.K. Rowling for a retweet. Outside of Harvey’s path, people are using their fully charged phones to call relief organizers with addresses they see on Twitter. People with boats, or friends with boats, are using Twitter to communicate directly with those in need of assistance. 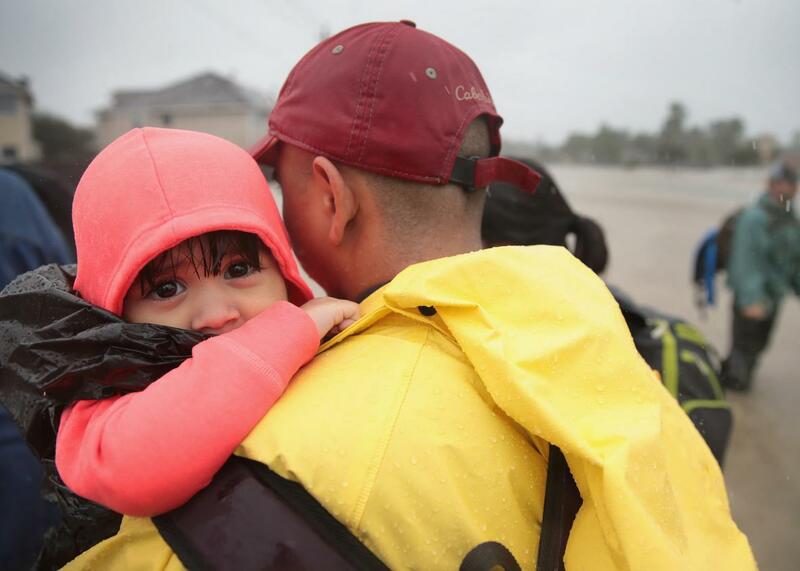 Even Ed Gonzalez, the sheriff of Houston’s Harris County, is tweeting to connect relief “partners” with residents in dire circumstances, including one who allegedly went into labor while waiting for help. As the first “major” U.S. hurricane in the Twitter era, Harvey is testing the platform’s capacity for large-scale rescue organizing, a purpose for which it wasn’t designed. Twitter has made it easier than ever for people in danger to amplify their distress signals, but its dispersed, nonlinear nature has muddled some of those signals beyond utility. Viral tweets for help are getting thousands of retweets long after the tweeters have been rescued, encouraging outsiders to further bombard emergency helplines with information that’s no longer needed—or worse, encouraging volunteers to send rescue boats to already-vacated properties. Kim Bui, a Los Angeles–based editor with NowThis, an outlet that produces videos on trending topics and distributes them on social media, has been trying to consolidate online relief-organizing efforts and spread accurate information since Harvey’s downfall. She says people are still tweeting her a call for help from a woman with a newborn, even though Bui knows the woman has already tweeted that she’s been rescued. “It’s really easy right now for someone to pull a photo or take a screenshot of twitter and send it as something that’s new,” she told me over the phone. “People are trying to elevate a cause, but there’s no way to check in Twitter for the origin of a post. There’s no metadata. … Some, I can tell, are Snapchat grabs, so I don’t know whether I’m responding to someone who needs help, or a friend, or someone who even knows this person.” As a social media journalist, Bui said she searches for the origin of reposted photos at least once a week, and it’s always a challenge. The only difference now is that it could be a matter of life or death for people in danger who are waiting for relief services overwhelmed by misinformation from well-meaning Twitter users. Bui started engaging with Harvey Twitter Sunday night when she saw several people posting that they needed help but couldn’t get through to 911. In case they didn’t know they could call the Coast Guard, too, Bui tweeted them the official Coast Guard numbers. When she found a couple of Google forms and a spreadsheet that were aggregating the addresses of people who’d asked for a rescue, she started adding in reports she saw on social media. Bui also saw reports that willing volunteers couldn’t get through to the number the Houston Police Department had asked residents to call to offer their boats for rescue missions. “I don’t have very many skills, but one of my major skills is social media reporting,” Bui said. “So I was like, I can at least find people who need help, and I can find people who have boats using search terms, and I can link them up.” As of Monday afternoon, about half of the people she’s tried to help have told her they’re safe now. Ideally, government agencies and NGOs would be able to field rescue requests from both 911 and social media, where users will never get a busy signal. “I wish there were a way for people to tweet at relief agencies, or at FEMA, or at Houston, and it goes into a spreadsheet that eventually gets pushed out to rescuers,” Bui said, chalking the current disconnect up to “tech sometimes moving faster than government can.” Technology has proven useful to the Cajun Navy, a Louisiana volunteer rescue organization that came together after Hurricane Katrina, which started sending members to Houston on Monday. The group is one of several to use Zello, a walkie-talkie app, to coordinate its relief teams, allowing anyone in the area to contact nearby rescuers. Google has mapped shelters and evacuation routes in Harvey’s path; another organizing effort called #HarveyRelief has used a different open-source mapping tool to lay out the rescue requests it’s logged and whether they’re still active. #HarveyRelief’s map will also prove useful to journalists, engineers, and scholars who’ll try to make sense of the storm after it’s passed. At that point, Twitter and Facebook will be doing what they do best after natural disasters: pointing people to relief organizations that need donations. Now that some rescue posts have gone viral, users are already trying to help those who’ve reached safety. A woman named Erykah got more than 11,000 retweets on a photo of her 3-week-old infant cousin with whom she was stranded on Sunday; on Monday, she posted that they were safe. In the replies, users asked for her PayPal information. “I have baby clothes. Please let me know if I can send you any,” one woman offered.